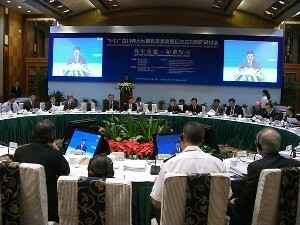 The International Symposium "5.12 Massive Wenchuan Earthquake Reconstruction & Catastrophic Disaster Control" was held in Chengdu, China on 22 and 23 September 2010. The event was jointly organized by the Provincial People's Governments of Sichuan, Shanx, and Gansu and the Chinese Academy of Governance. Mr. Onishi, Senior Administrative Manager of Asian Disaster Reduction Center (ADRC) was invited to participate. Around 130 representatives from international organizations, national and local governments, and experts from 30 countries and organizations in America, Europe, and Asia attended the symposium. On day 1, the participants visited the reconstruction sites in Yingxiu town, Shuimo town, and Dujiangyan city to look at the progress of recovery. On day 2, presentations concerning the theme "Scientific Reconstruction and Harmonious Development" were made. The title of Mr. Onishi's presentation is "From Resilient Recovery to Sustainable Development: Development of Recovery and Rehabilitation Measures".